Barcelona is located in the northeast of Spain and has great land, sea and air communication. The international airport, Barcelona-El Prat, links the city with the world's main capitals. 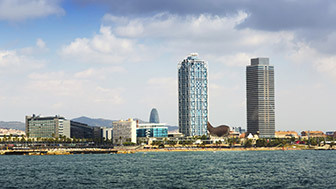 The city has a range of sea links, while road and rail are also good ways of getting to Barcelona. There are various ways of flying to Barcelona. The international airport Barcelona-El Prat, 12 kilometres from the city centre, and easily reached by public transport, connects Barcelona with the world's main capitals. It has two terminals and around a hundred airlines operate from there. There are also three smaller airports near Barcelona used by low-cost airlines. These are Girona-Costa Brava, Reus and Lleida-Alguaire. 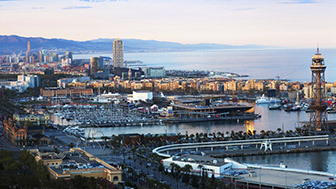 The Port of Barcelona is one of the most important in the Mediterranean: it has 9 passenger terminals, 7 terminals for international cruise ships and 4 more for ferries that connect the city with the Balearic Islands and the main ports of southern Europe. There is also space for private boats: along the Barcelona province coastline there are 14 marinas, four of which are in the city itself. From Barcelona, there are direct connections by train with the rest of Spain and several major European cities. The high-speed train service connects the city with the north of Catalonia, France, Madrid, and the southern coast of Spain. 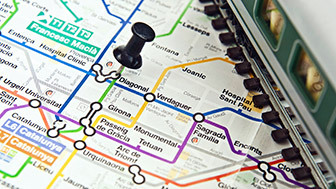 An ample network of stations on the suburban lines connect the city to the rest of Catalonia, while the Ferrocarrils de la Generalitat have lines that run from the centre of Barcelona to the main cities in the Vallès and Anoia counties. It is possible to get to Barcelona by bus from Europe, North Africa and all over Spain. The Barcelona Nord station is where you find the main national and international connections, but there are also buses that leave from Barcelona Sants and other places in the city. An extensive network of roads and motorways makes it easy to get to Barcelona by car from France and anywhere in Catalonia and the rest of Spain. The city is 150 kilometres from the French border and linked to the French motorway network by two toll motorways, the AP-7 and the C-32, and the N-II national road. Drivers can also take the AP-7 and the C-32 to get to the city from the south. Two ring roads, the Ronda del Litoral and the Ronda de Dalt, provide direct access to the city centre.